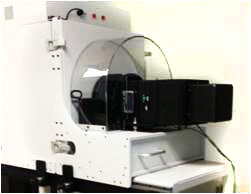 The ULTRA L is a high performance “Lab” system that provides thermal conditioning, mechanical stimulus and an electrical ATE signal path for testing Micro-Electro-Mechanical Systems (MEMS) Accelerometers and Gyroscopes. The system is intended for device verification, validation, and device engineering tasks, eliminating the need to use expensive, high volume manufacturing equipment to perform these tasks. The system allows up to 96 devices to be tested in parallel.